In a bid to limit subletting abuse, the Housing & Development Board (HDB), Singapore’s public housing authority, has recently revised the regulations for Singapore permanent residents (PRs) to sublet HDB apartments. Under the revised ruling, effective 11 July 2012, PRs will be allowed to sublet their HDB apartments for one year after meeting the Minimum Occupation Period (MOP) of a year (down from three to five years), if they have not sublet the apartment before. Upon expiry of the one-year period, the application to sublet will be assessed on a case-by-case basis and approval will be granted only if there are extenuating reasons. Additionally, the maximum subletting period is capped at five years. Previously, both citizens and PRs were allowed to sublet their apartment after the MOP of three to five years. Property owners were also granted subletting renewals upon the expiry of each three-year period, with no cap on the number of renewals and the total subletting period. While there is no change in the subletting rules for flat owners who are Singapore citizens, HDB has made it clear in a statement that subletting of HDB apartments should be temporary measures and if permanent residents do not use their apartments for their own residence, they should let the property go on the market for resale so as to benefit other residents who are keen to live in them. In 2011, HDB carried out 7,000 flat inspections and took action against 56 flat owners who were infringing subletting regulations. Additionally, HDB has initiated compulsory acquisition action against 18 flat owners for blatantly infringing subletting rules. The authority has also reminded HDB flat owners that subletting of bedrooms or apartments to tourists is a serious offence. “Through this revision, HDB is enforcing the policy that its apartments are meant for owner residence and should not be milked for rental yields. 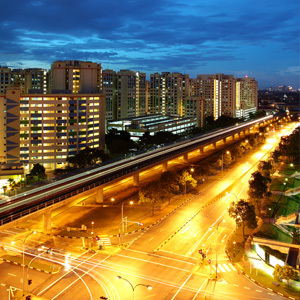 Singapore is a densely populated city with very limited land resources and public housing is a way to make property affordable for Singapore’s core population. The 89% increase in subletting approvals by HDB between 2009 and 2012 meant that less apartments were up for resale which in turn heated up the public property market in spite of a record 25,000 build-to-order flats being launched this year. In gist, the latest move by HDB seeks to ease property market pressures and increase the supply of resale apartments for deserving parties,” said Mr. Satish Bakhda, Head of Operations at Rikvin, a Singapore Company Registration specialist. “Although only about 5000 flats owned by PRs have been approved for subletting, and some may argue that the impact of this measure may be minimal, the message is clear. To encourage harmony between new residents and citizens, we have a common interest to respect the rules in the country we live in as well as to respect the common spaces we share. As affordable housing is limited in Singapore, it is a matter of courtesy, common sense and respect for a fellow human being to release the house we no longer need so that another family can make it a home,” added Mr. Bakhda. As the supply of flats available for subletting decreases, the HDB rent market may increase in the near term, “However, as the singapore work visa and the Professional, Technical Personnel and Skilled Worker and Singapore Dependant Pass frameworks have been refined, the reduction in demand for HDB apartments may follow, ensuring that rental pressures remains short-term,” concluded Mr. Bakhda.